Laura Evans Manatos is President and Founder of Laura Evans Media, a media consulting company working to break through the noise of negative news to ensure audiences learn about the innovative change makers among us. Laura’s clients strive to make us better, our communities healthier and our world kinder. She helps them get their message heard and their story told. 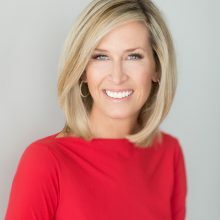 Before launching her own media consulting business, Laura served as Primary Anchor of Fox 5 News at 5, the top rated 5pm newscast in Washington, DC. In her journalism career spanning more than 25 years, including 18 years as an Anchor/Reporter with Fox5DC, Laura’s reporting earned her numerous honors and awards including two Emmys and five Emmy nominations. Laura was among the first reporters on the scene following the 9/11 attack on the Pentagon, she covered multiple political conventions, presidential elections, human interest features and she flew with the Blue Angels. Laura has also landed exclusive sit down interviews with some of Washington’s biggest newsmakers. Laura is known throughout the DC metropolitan area as one of her industry’s most active supporters of local charities. Laura is a founder and leader of the DC Newswomen: a collaboration of more than 20 on air personalities that hosts the annual “NewsBash Against Breast Cancer”, raising money for various local breast cancer charities. She also single handedly launched a successful mindfulness program at a Bethesda elementary school. Laura and her husband Mike have 3 children, Sienna, Andrea and Lucas and a Yorkie named Gibbs.